As the parent of young children, it's hard to find a moment for yourself. 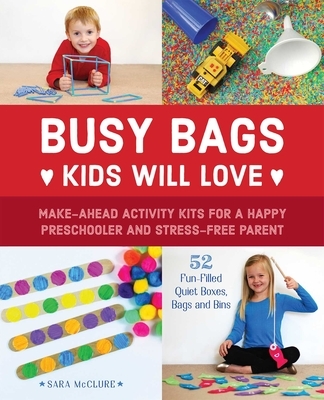 Busy Bags Kids Will Love offers you a smart way to keep your kids engaged so you can relax. With step-by-step instructions and color photos on each page, it will teach you how to make fun, unique games with simple arts-and-crafts materials you have at home. Sara McClure is a mom and certified teacher with experience in early childhood education. She holds a bachelor's degree in Child and Family Studies with an emphasis on Early Childhood Education for grades preK-4 and a master's degree in Urban Education. After five years of classroom teaching she transitioned to homeschooling her two boys. To save her sanity, she uses busy bags to keep her younger son entertained while she teaches the older son. She is the blogger at HappyBrownHouse.com where she shares meaningful learning activities for kids, recipes, and a peek into her homeschooling life.